Designation: Department of Pharmaceutical Chemistry, Enugu State University of Science and Technology. List of Author(s): Okorie NH, Mbah CJ. Citation: Okorie NH, Mbah CJ (2018) Study on the In-vitro Release Kinetics of Olmesartan-loaded Optimized Solid Lipid Nanoparticles. Int J Nano Rech. Vol: 1, Issu: 1 (24- 32). Copyright: © 2018 Okorie NH, et al. This is an openaccess article distributed under the terms of the Creative Commons Attribution License, which permits unrestricted use, distribution, and reproduction in any medium, provided the original author and source are credited. Drugs with low aqueous solubility not only give low oral bioavailability but provide high inter-and intra-subject variability. Solid lipid nanoparticles (SLN) have gained much interest as potential drug carriers for lipophilic drugs. Olmesartan medoxomil has very poor aqueous solubility and belongs to Class II drugs under Biopharmaceutical Classification Systems. The objective of the present study is to determine release kinetics of Olmesartan medoxomil- loaded solid lipid nanoparticles. Olmesartan medoxomil-loaded solid lipid nanoparticles was prepared by hot homogenization and ultra-sonication method. Particle size, polydispersity index, shape and surface morphology were used to characterize the formulations. The degree of encapsulation of the drug in the formulations was estimated by determining the drug entrapment efficiency. The in-vitro drug release from the formulations was studied using dialysis membrane. The drug release kinetics of the formulation was analyzed using different kinetics models. The results show that the formulations are spherical in shape with smooth surface and possess particle size range of 122.8-135.0 nm, polydispersity index range of 0.208-0.239. The entrapment efficiency was in range of 94.5-96.8%. Fourier transform infrared spectroscopy (FTIR) and differential scanning colorimetry (DSC) test results are considered to be satisfactory. The in-vitro drug release study demonstrated that drugloaded formulations possessed controlled drug release characteristics. The kinetics release results suggest the possible mechanism of action for the drug release might be diffusion of the drug from the formulation. Zero-order drug release kinetics model out of the models investigated, best fitted the in-vitro release data. A number of lipid-based delivery systems for enhancing the bioavailability of lipophilic drugs have been reported. Such systems include microemulsion [1-3], nanoemulsions [4-6], liposomes [7-10], self-emulsifying drug delivery systems [11-13]. Solid lipid nanoparticles are colloidal carrier systems that have advantages over these particulate drug carriers [14-16]. The solid lipid nanoparticles are composed of physiological lipid, dispersed in water or in an aqueous surfactant solution. The solid lipid core may contain triglycerides, glyceride mixtures, or waxes that are solid at both room temperature and human body temperature [17-19]. Due to their good biocompatibility, low toxicity, physically stability and better delivery of lipophilic drugs these solid lipid nanoparticles formulations have been developed for various routes of applications namely dermal, ocular, oral, parenteral, pulmonary and rectal. These formulations can be used to improve the bioavailability of drugs [20, 21], obtain sustained release of lipophilic drugs [22-24]. Olmesartan medoxomil (Figure 1-3) chemically defined as 2,3-dihydroxy-2-butenyl 4-[1-hydroxy-1- methylethy]-2-propyl-1-[p(o-1H-tetrazol-5-ylphenyl) benzyl] imida-zole-5-carboxylate, cyclic 2,3-carbonate is a selective AT1 subtype angiotensin-II receptor antagonist. It acts by lowering blood pressure through arterial vasodilatation and reduced sodium retention . Clinically, it used in the treatment of hypertension . Olmesartan medoxomil is available only as tablets in doses of 5 mg, 20 mg and 40 mg respectively . It is practically insoluble in water (<7.75 μg/ml) and rapidly absorbed from the gastrointestinal tract with peak plasma concentration of olmesartan (metabolite) occurring 1-3 h after administration. Olmesartan medoxomil is converted during absorption to olmesartan, which is subsequently excreted without further metabolism . The absolute bioavailability of olmesartan from olmesartan medoxomil tablets is 28.6% with an elimination half-life of 10-15 hr . Literature survey has shown that some methods [30-33] have been used to improve the bioavailability of olmesartan medoxomil, however, as solid lipid nanoparticles delivery system has not been explored for olmesartan medoxomil, the drug based on its physicochemical and biopharmaceutical properties was selected as a good candidate for solid lipid nanoparticle formulation. In-vitro dissolution studies/drug releases are very vital for the development of new pharmaceutical dosage forms and serves as an alternative to in-vivo bioavailability determination . Good correlations have been established between in-vitro dissolution/drug release and in-vivo absorption . A number of mathematical models  have been exploited in determining the drug release kinetics. These predictive mathematical models describe the relationship between in-vitro property of dosage form and a relevant in-vivo response. Therefore, the objective of the present study was to investigate olmesartan medoxomil-loaded solid lipid nanoparticles release kinetics using predictive mathematical models while envisaging that the results obtained will support the use solid lipid nanoparticles formulation as a potential delivery system for olmesartan medoxomil. 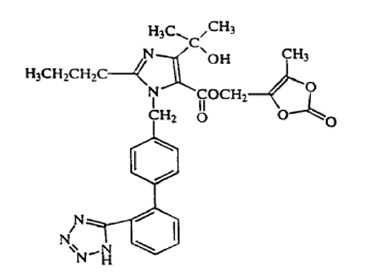 Figure 1: Structure of Olmesartan Medoxomil. Sample of SEM image of the formulations (F1, F3, F5 and F7). 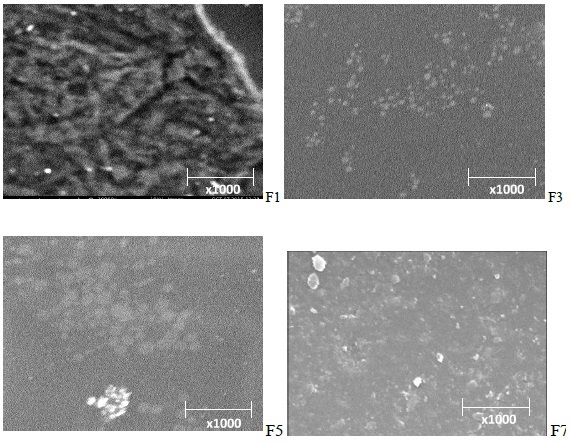 Figure 2: Sample of SEM image of the formulations (F1, F3, F5 and F7). Fourier Transform Infrared spectroscopy of Olmesartan Medoxomil glyceryl monosterate soy lecithin, polysorbate 80, physical mixture and solid lipid nanoparticles formulation. 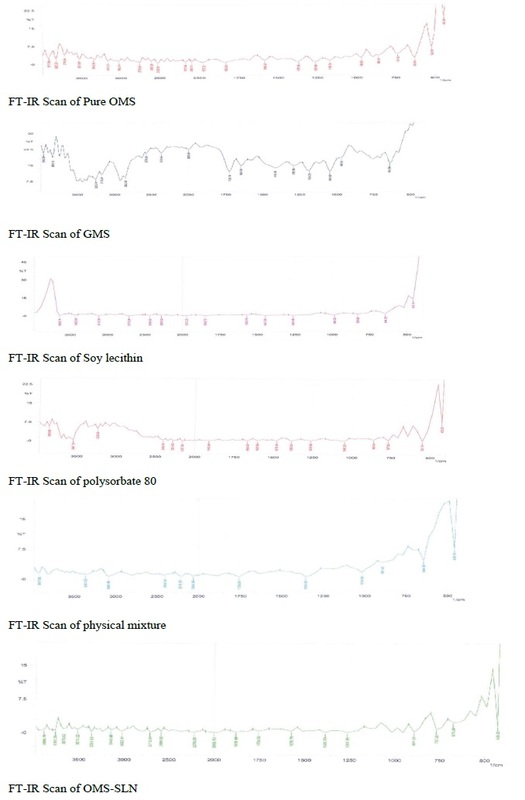 Figure 3: Fourier Transform Infrared spectroscopy of Olmesartan Medoxomil glyceryl monosterate soy lecithin, polysorbate 80, physical mixture and solid lipid nanoparticles formulation. Olmesartan medoxomil (Sankyo Pharma Inc., USA), glyceryl mono stearate (Sigma-Aldrich, USA), soya lecithin (Himedia Ltd, India), polysorbate 80 (Sigma-Aldrich, USA). All other chemicals were of analytical reagent grade. Olmesartan medoxomil, glyceryl mono stearate, and soya lecithin were dissolved in a beaker containing 10 mL mixture of chloroform and methanol (4:1). Organic solvents were completely evaporated on a water bath. The lipid layer having the embedded drug was melted at temperature 5°C above melting point of the lipid. An aqueous phase containing polysorbate 80 heated to the same temperature as the oil phase was slowly added to the oil phase while homogenization was carried out at 12,000 rpm using Ultra Turrex T25 homogenizer (IKA labotechnik) for 5 min. The coarse hot oil in water emulsion was ultrasonicated (12T-probe) using a Vibra cell (Sonics, USA) for 20 min. Olmesartan medoxomil loaded-solid lipid nanoparticles formulation was got by allowing hot formulation to cool to room temperature. The mean particle size and polydispersity index of the nanoparticles preparations were determined using a zetasizer (DTS Version 4.10, Malvern instruments, UK). Samples were appropriately diluted with deionised water to allow the light scattering intensity to be within the instrument’s sensitivity range. The samples were analyzed by Fourier transform infrared (FT-IR) spectroscopy in the range of 400 to 4,000 cm−1. The infrared spectral analysis of pure olmesartan medoxomil, glyceryl mono stearate, soya lecithin, physical mixture of drug plus excipients and olmesartan medoxomil loadedsolid lipid nanoparticles formulations were carried out. The vibration frequencies of the spectra peaks produced by the pure drug, physical mixture and solid lipid nanoparticles formulation were compared. Shape and surface morphology of the solid lipid nanoparticles formulations were analyzed using scanning electron microscopy (SEM). The samples were mounted on alumina stubs using double adhesive tape, coated with gold in HUS-5GB vaccum evaporator. The analysis was done using Hitachi S-3000N SEM at an acceleration voltage of 10KV and a magnification of 5000×. The test was done on a calibrated instrument under nitrogen purge (20 mL/min) at a heating rate of 100C/min and temperature range of 25–2000oC using Netzsch DSC 200PC (Netzsche, Selb, Germany). The sample was weighed into standard aluminum pan while using the empty pan as reference. A 2 ml of each solid lipid nanoparticles formulation was diluted to 10 ml using ethanol. The absorbance of the drug in all dilutions, were measured at 258 nm. The total drug content in each formulation was obtained from calibration curve. Stability testing was done on olmesartan-loaded solid lipid nanoparticles formulations at room and refrigerator temperatures for 0, 30 and 60 days. Particle size, polydispersity index and entrapment efficiency determinations were parameters used to follow the stability study. Study was done in triplicate. Statistical analysis of the data was performed using the Student’s t-test and significance of the study was chosen at p<0.05. Dialysis bag was used for the in-vitro drug release determination. The bag was soaked in distilled water for 12 h prior to been used. A 5 ml aliquot of solid lipid nanoparticles formulation devoid of free drug or olmesartan medoxomil suspension was placed into dialysis bag and tied at both ends. The dialysis bag was immersed in a receptor compartment containing 50ml of saline phosphate buffer solution (PBS) pH 7.4. The receptor compartment was placed on a magnetic stirrer and stirred at 37±1°C using a magnetic bar. At various time intervals (5, 10, 20, 30, 40, 50, 60, 90, 120, 180, 240, 300 min up to 12 h) a 5 ml of aliquot was withdrawn, filtered using Whatsman filter paper. An equal volume of fresh medium was added to the receptor compartment. The filtered samples were analyzed for drug contents by UV-Visible spectrophotometry at 258 nm. Plot of percent of drug released versus time was carried out. In-vitro drug release data were fitted into various kinetic models such as zero order (cumulative amount of drug released versus time), first order (log cumulative percentage of drug remaining versus time), Higuchi model (cumulative percentage of drug released versus square root of time) Hixson Crowell model (cubic root of initial drug concentration minus cubic root of drug concentration at a given time versus time, Qo1/3-qt1/3) vs t.) and Korsmeyerpeppas model (logarithm of fraction of drug released versus logarithm of time, log (Qt/Q∞) vs log t). The best‐fit model was chosen based on the highest correlation coefficient obtained from the regression analysis. The homogenization followed by ultrasonication technique used to prepare the solid lipid nanoparticles formulations have been reported to be simple, reliable and reproducible method for preparation of solid lipid nanoparticles . The solvent mixture of chloroform and methanol (4:1) was found to be very effective in homogenously dispersing olmesartan medoxomil in the lipid phase. The composition of the formulations, are given in Table 1. Table 1: Composition of Olmesartan Medoxomil solid lipid nanoparticles formulations. The particles of size range of 122.8-135.0 nm, polydispersity index range of 0.208-0.239 were obtained for olmesartan medoxomil-loaded solid lipid nanoparticles formulations (Table 2). The particle size results suggest that the formulations have the potential to give high drug release from the nanoparticles matrix, good gastrointestinal uptake and in-vivo distribution of the drug. Previous report has shown that particle size less than 300 nm are advisable for the intestinal transport . The polydispersity index results also substantiated the optimum size distribution of the nanoparticles. Table 2: Particle size, polydispersity index, percent entrapment efficiency and percent drug content. It has been reported  that a polydispersity index value less than 0.3 is often accepted as optimum value. The test showed that most of the particles were smooth and fairly spherical in shape. It was also noted that the particle sizes of the formulations were in the nanometric range. The infrared spectroscopic studies were done to determine possible drug-lipid interactions. The IR spectrum of pure olmesartan medoxomil showed sharp characteristic peaks as given in Table 3. The characteristic peaks appear in the physical mixture indicating no modification or interaction between drug and the excipients. However, these characteristic peaks were not found in the solid lipid nanoparticles formulations suggesting that the drug might have been molecularly dispersed within the lipid matrix. The DSC thermograms of olmesartan medoxomil and drugloaded solid lipid nanoparticles formulation (F3) are shown in (Figure 4,5). The thermogram of olmesartan medoxomil shows endothermic peak at 178.7°C. It was observed that the melting endotherm of olmesartan medoxomil was shifted to lower temperatures in formulations. For example it was shifted to 110.4oC for F3 in the thermograms of drug- loaded solid lipid nanoparticles. The observation tends to suggest that olmesartan medoxomil was not in crystalline state but completely solubilized in the formulation. Differential scanning calorimetry of Olmesartan Medoxomil, glyceryl monosterate, soy lecithin, polysorbate 80, physixal mixture and solid lipid nanoparticles formulation. 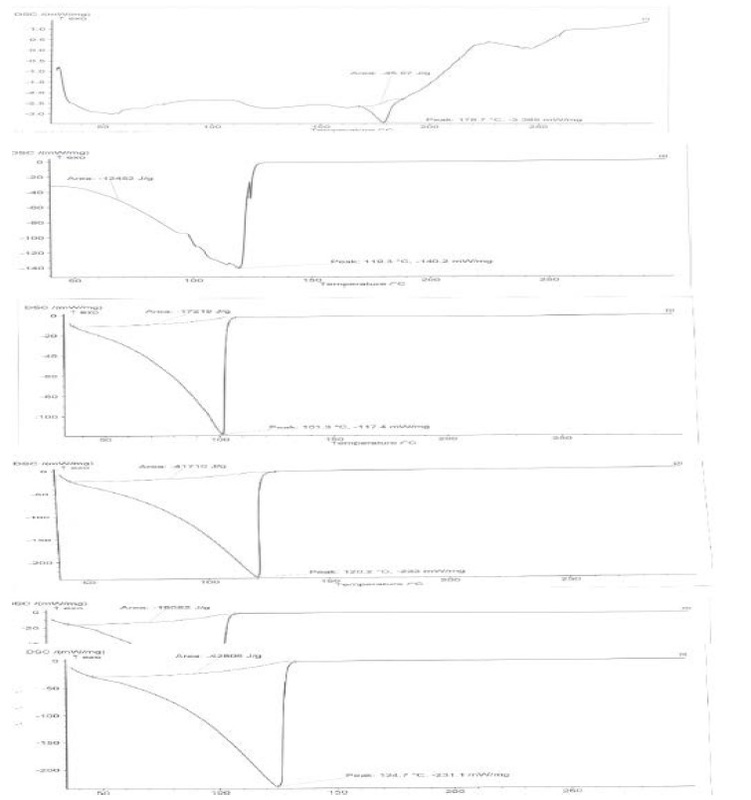 Figure 4: Differential scanning calorimetry of Olmesartan Medoxomil, glyceryl monosterate, soy lecithin, polysorbate 80, physixal mixture and solid lipid nanoparticles formulation. Percentage drug release graph of OLM-SLNs formulations. 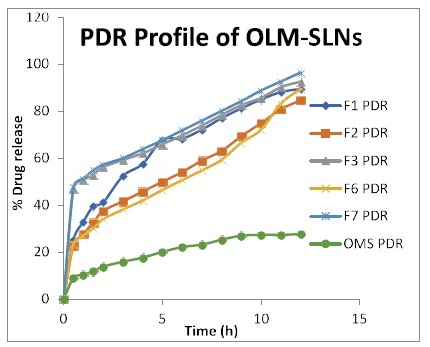 Figure 5: Percentage drug release graph of OLM-SLNs formulations. The results of the entrapment efficiency of olmesartan medoxomil-loaded solid lipid nanoparticles formulations are listed in Table 2. Among the formulations, highest entrapment efficiency (96.8 ± 0.03%) was observed with formulation of SLN F7, whereas formulation SLN f5 showed lowest entrapment efficiency (79.4 ± 0.05%). As the lipid concentration increased there was a decline in entrapment efficiency of the formulation. The results are in Table 4 shows that there was no significant difference (P<0.05) in particle size and polydispersity index values. Although the zeta potential of the formulations is not reported in the present study, the results of the stability study suggest that the zeta potentials of the formulations are within the acceptable range. Zeta potential is a key factor for evaluation of the stability of colloidal dispersions. Table 4: Stability studies of Olmesartan Medoxomil loaded SLN formulations (room and refrigerator temperature). To evaluate the release rate of olmesartan medoxomilloaded solid lipid nanoparticles formulations, the release of olmesartan medoxomil from the lipid particles was investigated for 12 h in saline phosphate buffer pH 7.4. All formulations showed sustained release of olmesartan medoxomil, and the cumulative percent drug release of olmesartan medoxomil loaded SLNs after 12hrs was found to be 96.5%, 92.7%, 89.6 % etc while that of aqueous drug suspension was 27.8 %. From the results, it was observed that, all the formulations showed higher release from all the formulations than the aqueous drug suspension, implying improved bioavailability. The results are shown in Table 5. Table 5: In vitro drug release profile. The release data of olmesartan medoxomil-loaded solid lipid nanoparticles formulations were fitted into various kinetic models (Table 6). The findings revealed that zeroorder model best-fitted the kinetic models that could be used to describe the release characteristics of olmesartan medoxomil loaded solid lipid nanoparticles formulations. In comparison with other kinetic models, the zero-order kinetics model possessed the highest correlation coefficients. Therefore, diffusion of the drug from the lipid matrix was suggested to be the probable mechanism of action. The values of release exponent (n) of all the formulations lies within n<0.5. These n values further revealed Fickian diffusion as the mechanism of action. Table 6: Drug release kinetics models. Olmesartan medoxomil was successfully incorporated into solid lipid nanoparticles by hot homogenization and ultrasonication method. The formulations were found to be in nanometric range with smooth spherical structure. The drug was found to be efficiently entrapped in the lipid matrix. FT-IR study revealed no interaction between drug and excipients. The release of drug from the formulations best-fitted Zero kinetics model equation and the probable mechanism of action indicates drug diffusion through the lipid matrix. Finally, the kinetics of in-vitro drug release results and other collected data suggest that solid lipid nanoparticles are potential delivery systems for olmesartan medoxomil.